Common Myths About Numerology Readings (Numerology Lesson 25) | Law of Attraction Plus: The Secret revealed! 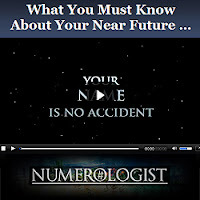 There are a lot of myths and misconceptions floating around out there about numerology readings. This article takes a look at what you can expect from a reading and some of the delusions that are commonly held (especially by the general public) about readings in general. First of all it is important to realize that numbers don't make things happen and they don't influence the future either. Numerology is more of a tool of analysis (and an ancient and respected way of analyzing character.) For instance if a famous person changes his or her name at the height of his or her success this does not mean that that the person is immediately in for a career disaster. Yet another thing to realize is that if you do change your name that you will not necessarily meet with success. The fake name is known as a façade in numerology and although it can be read it is not as significant as other numbers. It will be read as and be analyzed as a supplemental reading. Changing your name does change your numerical vibration and it can help the public perceive you as different persona but it does not really change your life. Accountability and maturity applied to free will creates the kind of decision making that can truly create positive changes in life. Giving the numbers too much power to change your fate is a big mistake. It is also a very superstitious thing to do. It is important to remember that the real value of numerology is in it's ability to analyze your character and see where your limitations and talents actually lie. You can then use your free will to make choices in life. Yet another delusion is that somehow you are limited by your numerology. For instance just because you are a 4, which is an unlucky number for most, it doesn't mean that fame, big money, fulfillment or love is unobtainable. It helps do several readings to get a full picture of what a person is capable of in life and also who he or she really is in life. Yet another thing to watch out for when getting readings is the "false firsts." Sometimes when people are doing something like choosing a wedding date in hopes of attracting good fortune they do not realize that the date that they met or started dating on is much more important. Another area of debate is when a Personal Year forecast starts. The true tradition is that they start on January 1st for everyone and end on December 31st for everyone. It is not just on a person's birthday. The peak energy of a Universal Year is reached on September. It is the same for every number in the numerological pantheon. Another myth is that "you have to be a master number in order to be an old soul." The numbers 7 and 9, which are lonely spiritual numbers are considered to be old souls. Then there are the karmic ally challenged numbers such as 2 and 4. When troubled the 2 is often seen in codependent relationships or replacing love with addiction. They are old souls that are often working it out with past life connections. The 4 is a sickly number that is said sometimes to be working out karma by suffering through health issues. The idea is that these burdens are being taken on in this life to balance out the karma in this life. Yet another belief is that you should use the name that you are most known by when using numerology. The truth is that you should use the full, legal birth name, exactly as it is on a certificate in a name numerology analysis. This is because nick names are more of a facade. You will get what is called an "image read" which is to be treated as a supplemental read to the information that you can glean from the full birth name as it is printed on our birth certificate. A good example of this is President Bill Clinton whose legal birth name is Jefferson Blythe IV. His last name is not even Clinton as he his father passed away from a car accident. He adopted the name of his step father Roger Clinton. To do a proper numerology chart of Bill Clinton you would actually have to use the last name Blythe. This is not a name you often see used when referring to this famous man. Most numerologists would handle this by reading all three of his names. Jefferson Bylthe IV would be read as the primary name and William Clinton and Bill Clinton would also be read as supplemental names. Another misconception is that the number 8 is the luckiest number when it comes to wealth. The numbers 5 and 6 are also big money makers. The 5 makes it simply from the intelligent application of logic and wise investments and the 6 often makes it by marrying through wealth or simply by leading such a pure, family oriented life that they never get into enough trouble to lose a lot of money. It often takes a full chart to be read before your complete numerological picture can be understood. This means reading all of your numbers including the Expression and Destiny Numbers in order to get a full picture of your personality. It is also important to remember that that numerology is an art that is more descriptive than predictive and that you are not necessarily limited by what a numerologist tells you is your fate in a reading. In fact one of the values of numerology is that it can help you find out what your personal weaknesses are and address them.